As we left the boat, we went straight to a boulangerie and a fromagerie, as you would do in France. John was quite defensive of the French lady behind the counter when she compared John’s legs to a frog. “No frog legs for you tonight baby!”. 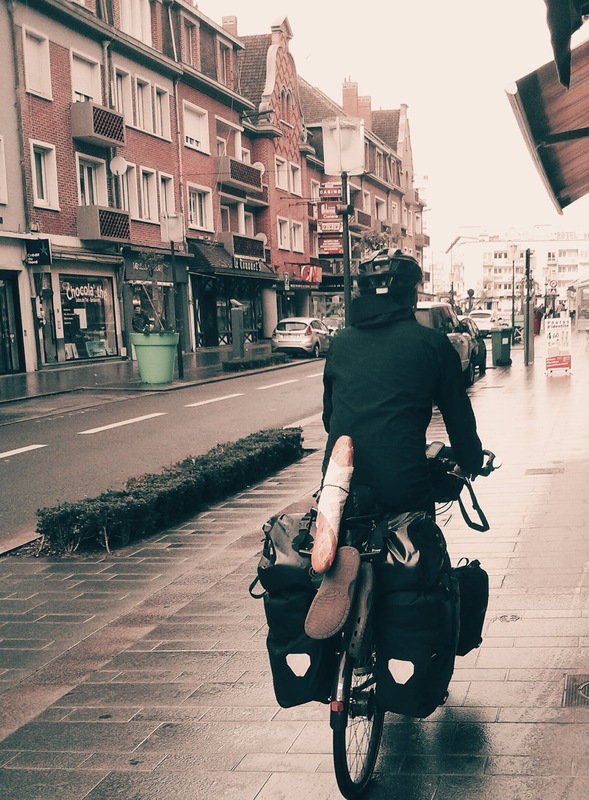 Pierre sporting our first baguette on French soil. We did some admin in Calais and headed as far out of town as possible. We had a few attempts at asking some local farmers if we could sleep on their front lawn and got told on more that one occasion “itz not possible”. Obviously there was a big language barrier here, because pitching a tent on some pedicured, lush green grass was very possible. It could also be that people around Calais are quite wary of foreigners with the large groups of emigrants loathing around and waiting for a ticket to England. We eventually asked our French mate from London, Brice to help translate and give us a crash course French lesson on e-mail to make sure it was not the latter. The lush green grass was not to be and we wild camped in a road next to a forest just beyond a market town Guines, twenty kilometres from Calais. The weather has just not worked for us so far and once again it was like sleeping under a waterfall, with a night of torrential rain. We woke up to our first friendly Frenchman, whom we had blocked from driving toward his forest maintenance job. He was quite happy to sharpen his tools for ten minutes whilst we were packing up the wet camp. After one of the best baguettes that we’ve had in France, for breakfast, we made tracks. Whilst riding up a steep mountain pass, we noticed an elderly couple struggling to move some roof beams. We jumped off our bikes ready to help them, only relived to give the steep incline a break. After moving some beams, they invited us inside for some French beer. 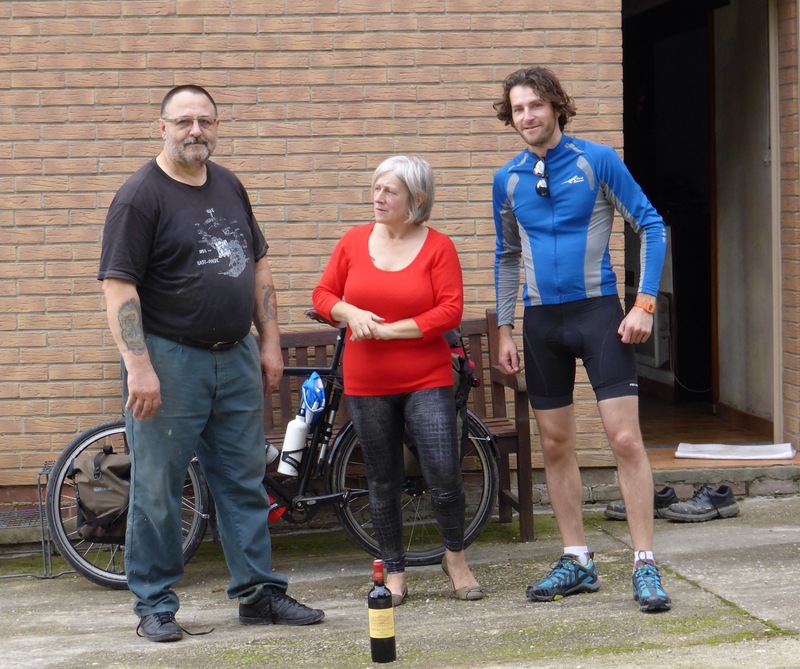 They were so amazed that we would be travelling all the way to Cape Town, that they needed to send us off with a beautiful bottle of 2006 Bordeaux wine and some home made apéritif. The French are good people! Hope that your weather fortunes turn, headwinds and rain are not cool. Sure I will be seeing report of tailwind and sunny skies and 200km covered! Infact I am going to check the weather now! Keep the updates coming, it is my daily escape to a story of adventure. Thanks Kathy. There’s more to come. We’re experiencing new things every day. It has been great. Thanks Janet, glad you guys got home safe (and before the storm). Thanks for the support. Funniest entry so far! Had me genuinely laughing out loud! Hilarious! Got a genuine lol from me! Hope all is well! All is well, thanks Joe. There’s more coming. Tell Peter the spreadsheet is looking good. I’m adding more stats every day. Thanks for the great updates boet. Enjoying the adventure and reliving it. This is fantastic, safe travel guys. John those legs!!!! Cool – brings back many happy times of biking around France……………… but on a Ducati motorbike!! Cheese and baguette is nice – but wine cheese and baguette is heavenly…. Hope weather improves for you guys. What was the wine like? I assume you’ve drunk it by now. Smashed it that very night. It was great.